Over on Comics Workbook, I have been giving assignments to contributors. Most contributors are graduates of my correspondence course so they are open to assignments for CW. I'm getting them to use index cards to make simple sequences--just like we do in the course. Mostly in sets of fours or eights. Sometimes six. I'm trying to get them all to think about their timing in new ways. Less focus on building a story and more focus on the inherent narrative structure within a set of four. More focus on "holding" and "doubling up" on an image and how holds can create space within the set of four. Here is the demo (by me) I give them for "holding" on a panel. I think of this more in musical terms of "holding a note" than I do in a cinematic sense of holding the "shot." I've redrawn each image slightly differently. Here's another demo I use for "holding." Check out this set of four by Connor Willumsen (below). Notice how he is "holding" on the image--and he is modulating the shot -- so it "moves" in sequence. Panels 1, 2, and 3 are all the same image from the same angle. However, it is not a static repeating of the image. Again, I think of this in musical terms. He is holding the note and the note is vibrating somewhat like a held note of, say, a trumpet. Think about grids in other settings. 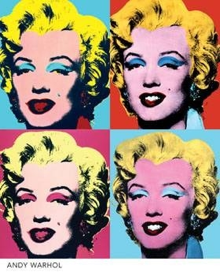 A grid of four Warhol portraits doesn't necessarily "read" 1, 2, 3, 4 in a left-to-right zigzag. It is just an arrangement. Yet in comics we assume the reader will know to read the panels in the correct order. I don't think this is something a painter often considers when hanging a grid of paintings. It is about the grouping and the images "work" together. A Japanese artist friend once looked at one of my "wordless" comics in a grid. He asked, "Which way do I read it?" because there was no clear motion sequenced out across the page. It was more of a collection of still landscapes. I said "any order" and he smiled. The grids of four can be stacked into grids of eight and then into "spreads" of sixteen across two pages. I call this a 4/4 time signature as shorthand. Four sets of four. The beat is on the FOUR. In six panel grids the beat is on the THREE. Totally different timings. Generally, we use 3 x 5 inch index cards and do sets of four, eight and sixteen. Or we use paper with a 10x13 inch live area that accommodates an eight panel grid. Here is a set of eight by Maggie Sutrov. Check out how she "holds" on the last three panels and how it rhymes with the first panel (below). Here's another example of "holding." Will Tempest "holds" on the same still life image in panels 1, 2, and 4 of the sequence of eight below. He is also zooming in slightly and showing us a little bit more of the still life each time. This is when I use cinematic terms and musical terms interchangeably. He is "modulating." It's not just a static repeat. He zooms in slightly and opens the image up across the set of four (below). What I want my students and CW contributors to do is to play around with simple sequencing within the sets of four. Sets of FOUR or EIGHT (instead of the set of SIX) are very adaptable to format changes. For example, one can reformat an eight panel grid (made on one page) into 2 spreads of four (below). If you tried the same reformatting with a six panel grid - because the beats are on the 3's - you would change the rhythm of the reveals on the two page spread. GR: Do you think that comics as a medium is more susceptible to an audience considering the creator's influences? AD: I don't want to outright reject the premise of the question, but this bugs me about the discourse surrounding comics: that really narrow scope of comparison... that comics are judged and discussed only in comparison to other comics, and usually in comparison to a narrow and established canon. I like Spiegelman and I like Crumb, there's stuff I also don't like about them, but it's strange that those two (amongst others), who are pretty old at this point, are still held up as some kind of measurement. I don't think it makes much sense to look at a comic made by a 21 year old in 2014 and try to shoehorn it into a cosmos where all of the main constellations are comics artists from 1965-1991. That or compare things made now to Fort Thunder, etc. Ultimately I don't see the reason or reward in guessing influences or looking for them in new work. Of course comparison is a natural way to understand things. But whether or not something looks to someone like something else isn't really interesting to me. Maybe this is my ego and the desire for my work to be looked at and judged on its own terms, maybe it's pretty anti-intellectual and anti-academic but I value the aesthetic experience of a work over trying to fit it into a larger (or smaller) context. Frank here again. We also have a translation of Barthélémy Schwartz’s 73 Notes on Comics from the French by Andrew White (with help from Schwartz). I'm really excited that editor Andrew White chose to tackle this piece. As Andrew said on his Tumblr, "It’s kind of a big deal, at least to me, that we’ve printed Schwartz in English for the first time (I think?). In the 1980s, he co-founded a magazine of comics criticism called Dorénavant, which became well known for its uncompromisingly avant-garde viewpoint. This is where the initial sections of73 Notes were first published. Jean-Christophe Menu, one of the co-founders of l’Association, is such a big fan of Schwartz that he covered Dorénavant and interviewed Schwartz in l’Eprouvette, l’Association’s short-lived magazine of criticism." Comics Workbook Magazine is edited by Andrew White and designed/co-edited by Zach Mason. If you are on Tumblr, please follow Comics Workbook. Please check out the archive HERE - it is an easier way to scroll through the content. Thanks! Over and out.